Halloween, one of the few times of the year you can get complimented for dressing absolutely crazy! Since outrgeous and scary costumes are de rigueur for Halloween, I took the liberty to do some Halloween nails! I thought nothing could scream Halloween better than cobwebs and splats of blood, so I attempted to incorporate both of them into my NOTD (Nail of the Day). 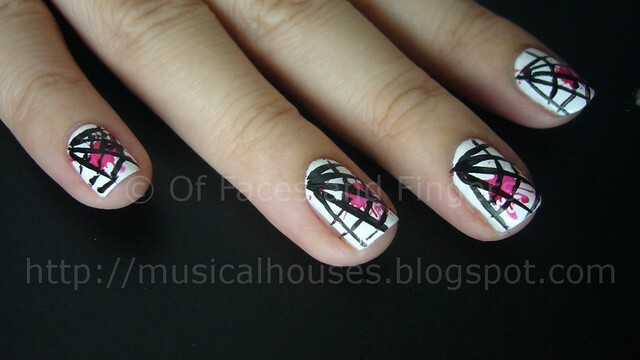 In the nail look below, it consists of two red blood splatters and a black cobweb on a white background. I don't know about you, but I kinda feel like this isn't quite as scary as I'd have liked. I really wanted to spook everyone out with my nails, but I actually ended up getting compliments on them - twice! At least, they thought it was nice until I explained how those cute designs were supposed to be spider webs and blood...Oops. The photo below shows what I used for this look. The white base was Wet n Wild White, the red blood splats were created by konading with Eyeko's Saucy Polish, using Konad Plate M21. I used the design of two paint splats on the M21 plate. 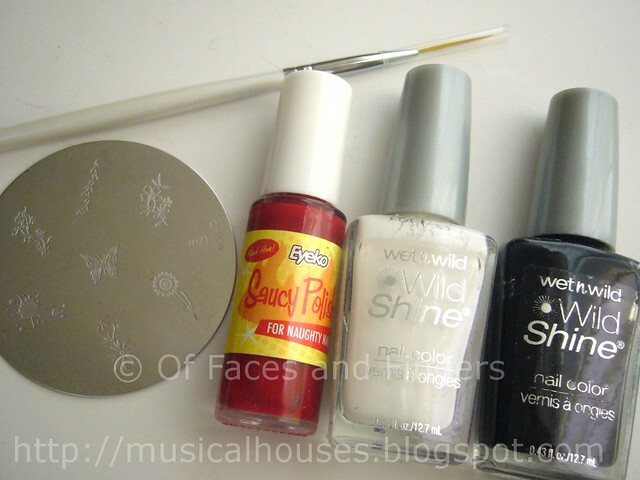 The cobweb was created by using Wet n Wild Black, and my new favourite plaything for nail art, my nail art brushes. I've never actually tried freehanding nail art with a brush before, so using the nail art brushes was totally new to me. I got mine from Born Pretty Store, and these are being sold in sets of three each, for the awesomely cheap price of US$2. Here is the link to the nail brush set that I bought. You get nail brushes of varying lengths, so these are perfect for drawing lines, curves, or, if you're skilled enough, I can imagine them being used for french tips and other similar nail art. I personally didn't notice much difference between using the longer or shorter lengths, but some others might - it really is personal preference. 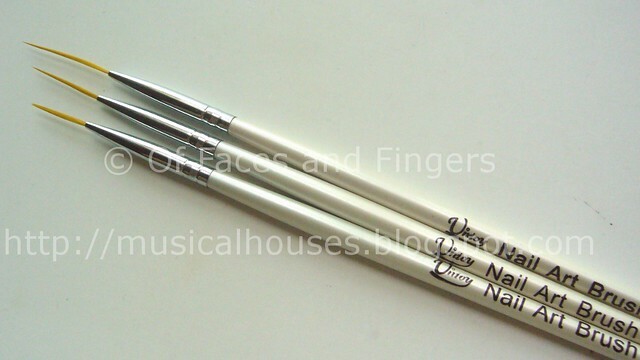 The bristles are thin and flexible, so you can really draw both thick and thin lines with these. For the cobwebs on my nails, I used the shorteset brush, dipped it in Wet n Wild Black, and basically just freehanded the lines. I did the straight vertical lines first before doing the horizontal lines. It's definitely not perfect, but I'm pretty happy with my first attempt at using nail art brushes! Here is a close up shot of my nails so you can see the lines created. I painted on the cobwebs after konading the blood splatters. I used Eyeko Saucy Polish for the konading of the blood splats because in my previous Eyeko Saucy Polish NOTD, it was opaque in pretty much one coat, so I thought it would be ideal for konading as well. Turns out, the blood splats looked a bit pinker than I'd like, but well, it does look like blood splats! Although I have to admit my Halloween nail art is a little bit noob-ish, I'm still enjoying it! I had never thought of doing nail art for Halloween before, but I was just so inspired by seeing all the different Halloween nail looks around the blogosphere. I'm so glad to be rocking my own Halloween nails! Why oh why, does Konad not love me as much as it does you? 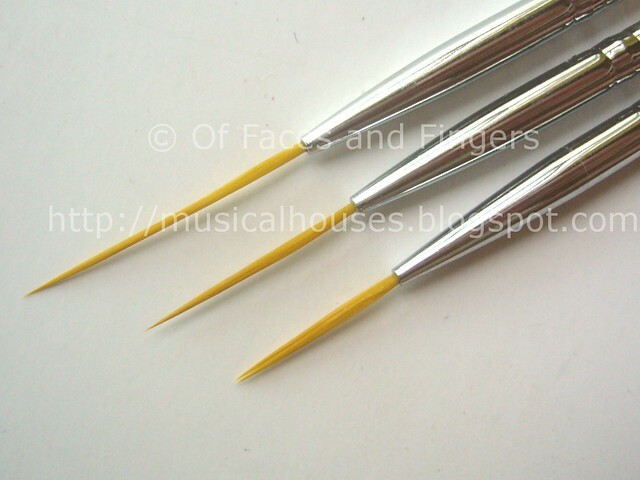 I have a couple of nail art brushes, but i find the length unwieldy. I need tutorials. This looks amazing! I'm a complete klutz when it comes to nail art and could never pull this off. Wow, good idea to do the splatter and cobwebs!! Aw, isn't this so cool? You just gave me an idea what to do with my nails. Time for a creepy nails, haha. WHAAA! How awesome! I wish my hands were steady enough for this.